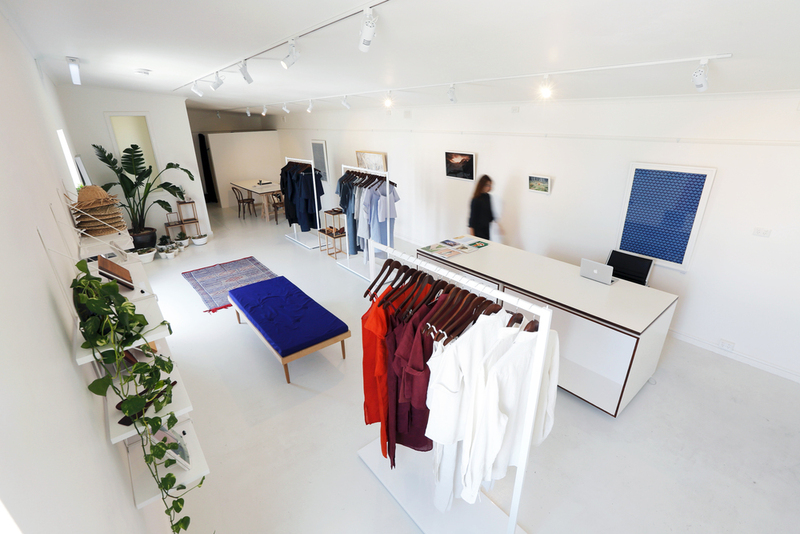 In recent months Anny and her partner, Adrian (an architect), have worked tirelessly to see her latest vision come to fruition, B GOODS LABEL OPEN STUDIO. I've had the pleasure of both visiting and working in this space and it is every bit as functional, clean, minimal and light-filled as the below imagery suggests... and most importantly, highly conducive to creativity. Anny herself is a tranquil, passionate woman, with a love of art, an intense dislike for waste and an informed eye that lends itself to the purest of outcomes, every time. [ KARA TOWN ] ORIGINALLY A PRODUCTION DESIGNER AND STYLIST, HOW DID THE TRANSITION INTO SUSTAINABLE CLOTHING AND HANDMADE ACCESSORIES ARISE? HAVE YOU ANY FORMAL FASHION DESIGN TRAINING? [ ANNY DUFF ] I had quite a unique introduction into a career as a creative. I had been shooting film works for a project in my final year of school, they won a couple of awards and I was sort of tossed into the film industry that way so I never really had time to think about it. I spent five years working as a camera assistant and slowly building my portfolio but never felt very satiated. I did a brief stint at art school majoring in ceramics and absolutely loved it. Being so hands on and so in control of what I was creating, I realized camera department wasn’t providing me these opportunities; I loved the industry but I knew I had more to offer. I have always had a keen interest in fashion but never thought it would lead to designing clothing, I just wanted to be involved in more creative processes. So I started working on anything I could as a Stylist and Production Designer, covering both wardrobe and art direction and was absolutely hooked. I think in a lot of ways I started B GOODS LABEL in reaction to what I saw were the negative aspects of the film industry; I felt conflicted by the throw away, trend driven approach and was always looking for an outlet, something that was my own, that I could be precious about and use as a platform to give back. That being said, I tried to approach the building of the business as I would any commercial project; set out the parameters, soundboard ideas, engage the necessary suppliers and collaborators and hope the ideas come across succinctly. Not studying fashion design, I have had to learn so much by trial and error but I have had some great support along the way. [ KT ] YOU PUT GREAT EMPHASIS ON THE ETHICAL FOUNDATIONS THAT ARE CONSIDERED INTEGRAL TO YOUR BUSINESS, IN WHAT WAYS DO THEY MANIFEST THEMSELVES DURING THE DESIGN PROCESS AND BEYOND? [ AD ] The ethics of the business were the most important thing for me right from the start. I spent a lot of my childhood growing up on a biodynamic farm that my parents built literally from the ground up. It was something they did together with unwavering conviction and even now those memories inspire me to keep persevering with B GOODS LABEL when things (inevitably) aren’t going to plan. Running a sustainable business may cost more (and its certainly not the easy road) but its clear time and time again you are getting the best possible outcomes from it. I wouldn’t have it any other way. My design process is kept fairly simple; I want the pieces to last both in terms of their durability and their style so I concentrate on classic cuts and trans-seasonal pieces as well as some Unisex styles (which are normally my favorites). We only use Hemp fabrics as it is a far superior, versatile and sustainably made fabric than any other natural fiber out there. We make our collections in very small quantities in Indonesia where a percentage of proceeds are sent to support families in need by providing food, education, shelter and medical aid. Back in Australia we also plant a native tree for every online sale to offset our carbon footprint. It means a lot to give back to the communities who are helping the label to grow. [ KT ] WHAT TYPE OF WOMAN AND MAN DO YOU DESIGN FOR? WHO WOULD YOU MOST LIKE TO SEE WEARING B GOODS LABEL? [ AD ] I like to think I design for creatives and professionals (both men and women) who enjoy clean lines and texture, who want simplicity in design, something that is effortless to wear day in, day out, and that lasts. My absolute hero and style icon is Margaret Howell. She is dashing.. I’m such a scruff ball (I often look like I’ve just stepped out of a tumble dryer) so I love seeing the range on other people. There’s been a few times recently (now that the label has had a few seasons) where I’ve seen some very chic individuals in B GOODS LABEL and I have died some very happy deaths..What a feeling! [ KT ] BOTH SANAM AND I FIND THAT WE ARE CONSTANTLY INSPIRED BY A GREAT MYRIAD OF THINGS, RANGING FROM ARCHITECTURE, TO FASHION, TO FURNITURE AND PRODUCT DESIGN, TO NATURE AND BEYOND. WHAT DO YOU FEEL INSPIRES YOU MOST WHEN DESIGNING A COLLECTION? [ AD ] My partner (and favorite person) Adrian is an Architect; we met whilst he was still in design school and eight years later we’re still dog-earing magazines and saving images to share with each other. We’re both obsessed the work of Finnish Architect, Alvar Aalto (to the point where we named our two Burmese cats after him and his wife Aino) and have a lot of his furniture in our home. My Stepfather is another huge design influence. He is a photographer and his personal style is quite minimalist but he is very particular so when he finds something he likes (especially with clothing) he has been known to buy a shop out of his size. He has introduced me to a lot of inspiring artists and designers like Peter Beard (I could spend days absorbed in his beautiful and profound collages), Khai Liew (an old friend of his and a phenomenal local furniture designer) and Gwyn Hanssen Pigott (a brilliant Australian Potter; she herself hated being called an artist or ceramicist and her work is oh-so-good). My year at Art School gave me the opportunity to research and covet artists for myself; Egon Schiele, Pierre Solages (I saw a solo exhibition of his in Paris a few years ago and still dream of those huge bold blue, black and white works of art) Mark Rothko’s divine celebrations of colour and Bill Viola (a thought provoking Video Artist who is coming to Adelaide festival this year, his particular work “Ocean Without a Shore” is just so incredibly captivating). But Nature inspires me like nothing else. Plants are my constant companions both at home and in my studio and I love nothing more than the feeling of having kept a happy healthy specimen. [ KT ] YOU BEGAN WORKING SOLELY WITH HEMP LINEN, BUT HAVE RECENTLY INTRODUCED HEMP JERSEY INTO YOUR RANGE. DO YOU FIND THERE ARE ANY CONSTRAINTS WHEN DESIGNING WITH ANY OF THESE FABRICS? WHY CHOOSE HEMP? I have been championing Hemp and its multitude of uses since the day I launched the label so I felt it was also important to show its versatility by diversifying the fabrics I used. The only constraints I have experienced has been with sourcing and supply, as Hemp is still not widely grown, due to outdated regulations which were introduced back in the late 1930s (backed by conspiring cotton growers who knew they had an inferior product). Hemp is truly a miracle plant; it breathes beautifully, is warming in winter and cooling in summer with the added benefit of having the highest UV rating of all natural fibers (which is so important here in Australia with our sun). As well as being a brilliant natural fiber, the rest of the plant can also be used to make paper, rope, building materials, skincare, fuel and food. 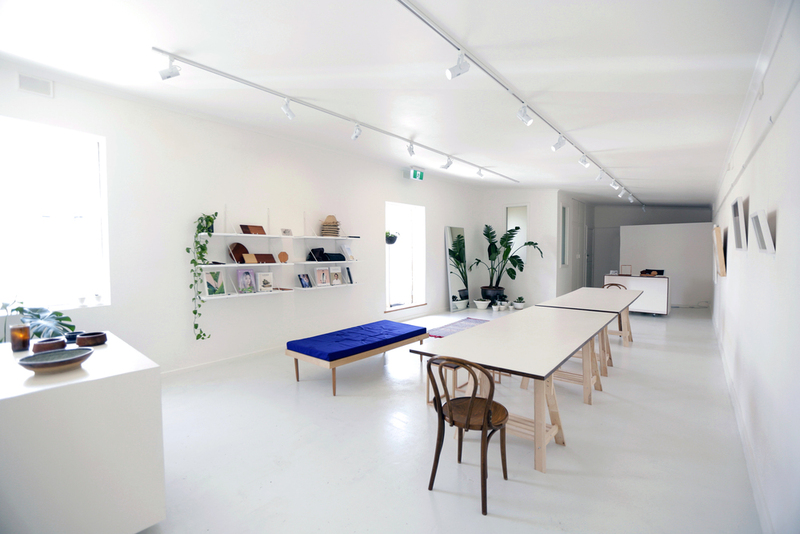 [ KT ] THE B GOODS LABEL’S OPEN STUDIO IS A RECENT ADDITION, HOW DID THIS SPACE COME ABOUT? [ AD ] I’ve always wanted to have a space In which I could really curate the label; its an amazing feeling to see my collections in stores sitting alongside other labels I admire, but having a space to work in that customers can come to and see what we’re about is next level. I didn’t think it was going to be financially possible for another few years but when this space came up around the corner from our home in the Adelaide CBD we jumped on it. It was an old Sunday school room in the back of a modern church so we weren’t paying for frontage but it still needed a lot of TLC. We were able to launch Open Studio on the first anniversary of B GOODS LABEL, which was such a thrill. We did a lot of the work ourselves to save money and it made the process so much more meaningful- we had a blast! I also got to see Adrian in his element (designing for the fussiest and most meddlesome client ever), and he was so Zen, I would work alongside him again in a heartbeat. Being in the space has given me a renewed belief in myself and in my vision for the label. [ KT ] I’VE HAD THE PLEASURE OF SPENDING A WHOLE DAY, WITH YOU, IN THE SPACE, AND WAS INCREDIBLY IMPRESSED WITH THE CLEAN, MINIMAL LINES INHERENT WITHIN THE STUDIO. WHAT WERE THE FUNDAMENTALS YOU CONSIDERED WHEN FITTING OUT AND STYLING YOUR NEW ENVIRONMENT? [ AD ] Travel has hugely influenced my aesthetic principles both personally and for the direction of the label. A trip to Japan a few years ago is continuing to inform a lot of my design decisions; I was completely captivated by the quiet simple traditional design culture so contrasted with the hard streamlined futuristic side of the new Japan. I loved their use of raw timbers sitting alongside whiteness and greenery; the designs had intention and were so refined. It fit so perfectly alongside what I already loved about Scandinavian design and when Adrian and I were planning the space these were the some of the influences we looked to. As I wanted the layout to adapt to a multitude of uses (including exhibitions, workshops, photo shoots and small events) we designed and built the furniture to allow for this, making it stackable and able to be separated or packed away. And of course the greenery takes pride of place! [ KT ] AS YOU KNOW, I’VE RECENTLY MOVED MY LIFE AND BUSINESS BACK TO ADELAIDE, MY HOMETOWN, (HAVING LIVED IN SYDNEY FOR EIGHT YEARS WITH MY HUSBAND) AND HAVE BEEN OVERWHELMINGLY IMPRESSED WITH THE EVIDENT GROWTH HERE IN RECENT YEARS. AS A YOUNG CREATIVE LIVING IN ADELAIDE, HOW DO YOU FEEL THE CITY NURTURES YOU AS BOTH AN INDIVIDUAL, A DESIGNER AND AS A SMALL BUSINESS? [ AD ] I moved back to Adelaide when I was six after a very nomadic early childhood, and what I have always loved about this city is its ability to humbly go about its business, and what it has going for it, it nurtures and it does it well. I’ve never felt the pull to the Eastern states, instead I’ve always felt like I owed Adelaide whatever I had to give, and it has always given back. In the three years since buying our home (in a corner of the City we hadn’t ventured to much), the area has come along in leaps and bounds and there is always something new and exciting opening. Friends and family who have moved away are visiting and not wanting to leave again. I feel the climate is right in Adelaide for young creatives to put themselves out there. We are building it and the people are coming! [ KT ] WHAT’S ON THE AGENDA FOR ANNY DUFF AND BOTH B GOODS LABEL AND OPEN STUDIO IN 2015? [ AD ] A lot of exciting things I hope! We’re releasing a sleepwear and bedding collection alongside some exciting collaborations with independent designers. I’d love Open Studio to be used as a hub for people to workshop ideas, launch new ventures and have some great events (and lots of parties). A bit of travelling with my main man is also long overdue. Scandinavia and Japan are both on the cards.